Cortana is really smart, but she isn’t perfect. Cortana does automatically get better, so just using Cortana is a great way to help. In fact, the more you use Cortana the better she gets for everybody. But your feedback is absolutely critical. Feedback helps us identify issues and focus attention to the most urgent needs. In this article, we’ll show you how to give feedback about Cortana, what we do every day with that critical feedback, and provide real examples where feedback has impacted changes to Cortana. One of the key sources of feedback comes from within the Cortana experience. You can provide ideas, likes and dislikes to our team. Each report is recorded by our system, including a screenshot (if you allow), as well as few key details such as the Windows language used. 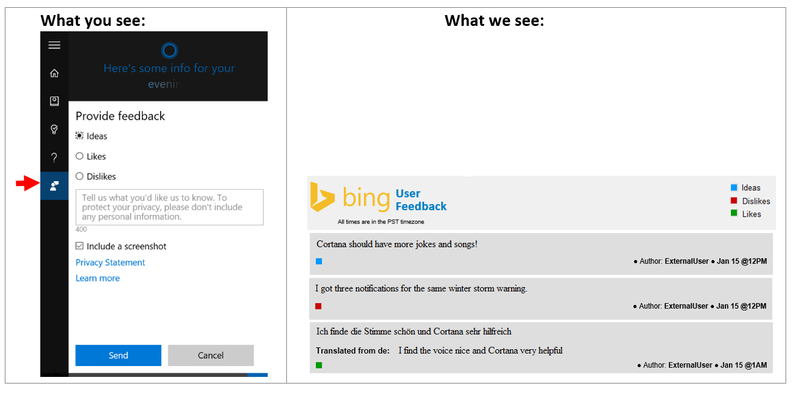 All that feedback is correlated into our system to the tune of thousands of items every week for Cortana alone. User-reported issues and ideas are key to finding which problems to concentrate on fixing first and what new experiences you want most. Don't forget to add positive feedback too - we use this feedback to see which experiences we should invest in with even more features. So does Microsoft really read all that feedback? But why didn't I hear back about my problem? The Cortana feedback system is anonymous. We don't have a way to address a specific report personally, but it doesn't mean we didn't read it and aren't looking into ways to make the product better. It's always satisfying when we see a new feedback report that says, "You listened to my idea!" Every week, our engineers share the feedback trends with the teams working on Windows search at Microsoft. This includes verbatim reports from those areas that are new, hot, or continuing to see dissatisfied users. We route bugs and issues directly to those that can address them first, then we take a look on a periodic basis for how we're doing with the feedback we've already received. Keep the feedback coming! Another great way to give us feedback is by using the Windows Feedback tool. 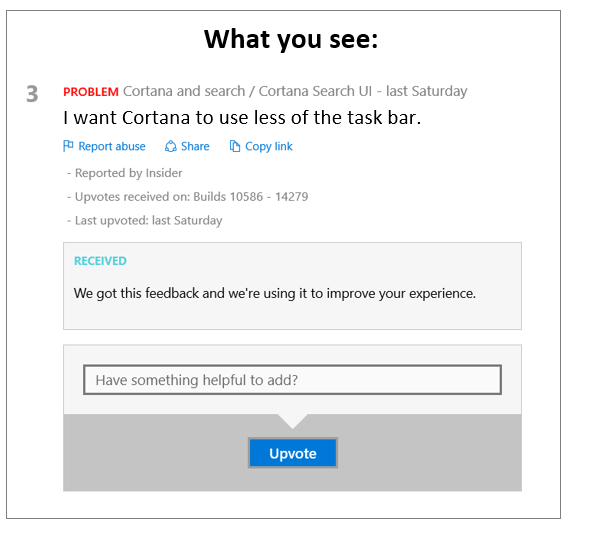 When you log a piece of Cortana feedback in the Windows Feedback tool, you are helping our team to understand what is important to you, and what changes you would like to see to make Cortana the most useful personal assistant we can deliver. Even better, when you find a piece of feedback that has already been filed and upvote it, that adds important data to that issue. The best way to help is to search for an existing piece of feedback that describes your issue. If it is already there, upvote it! If the feedback needs some more details, please add them in the “Have something helpful to add?” field. If you can’t find your issue or suggestion, please create a new item. The best pieces of feedback describe only a single issue, so other users can easily find them and so the upvotes added to that issue are clearly understood. Yes! Every upvote is important! We are able to analyze the information included with the upvote to generate some useful views into the data. For example, we can use upvote data to tell how often an issue is being reported from a particular build, flighting ring, region, or platform. When we first shipped Cortana on the desktop, the final step of setting up Cortana required that users convert the local account they use to sign into their PC into a Microsoft Account. Our Insiders reported that this was not quite ideal, and that feedback helped us prioritize the fix. 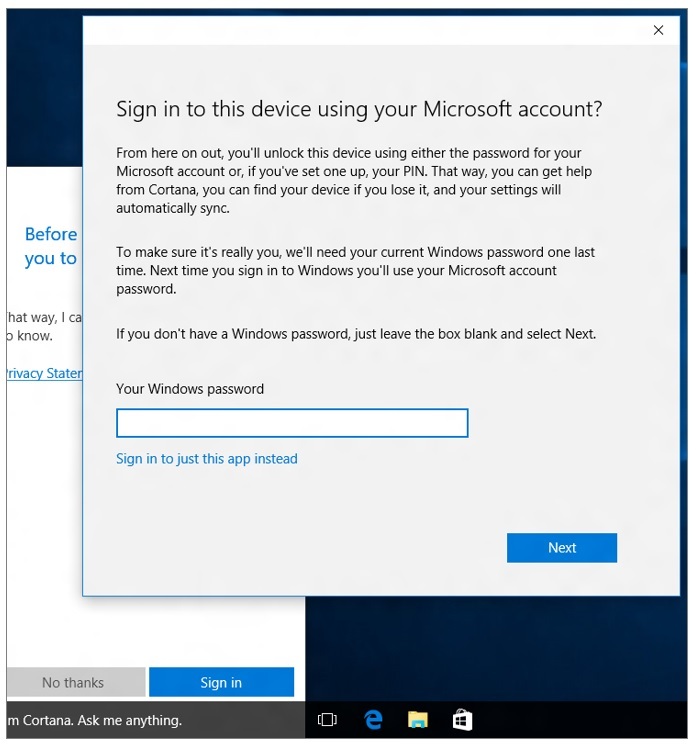 Now when you are setting up Cortana for the first time, you are given the ability to “Sign in to just this app instead”, instead of switching your entire login to use your Microsoft Account. This brings Cortana in-line with the other Windows 10 apps that make use of your Microsoft Account, such as Groove and Store. Another of the first major pieces of feedback that we received via the Insiders program was that the taskbar-enabled Search Box, while useful, was taking up too much space. The Cortana team was able to quickly respond to that feedback by adding additional sizing options to the search box, accessible via the right-click context menu. While we encourage Windows Insiders to take a look at our latest features, we received a lot of feedback that it wasn't as easy for others to discover what experiences make up Cortana. Now, the ? icon is a "What can you do?" page that is now there to help. · The comma was missing after a salutation including a person name. 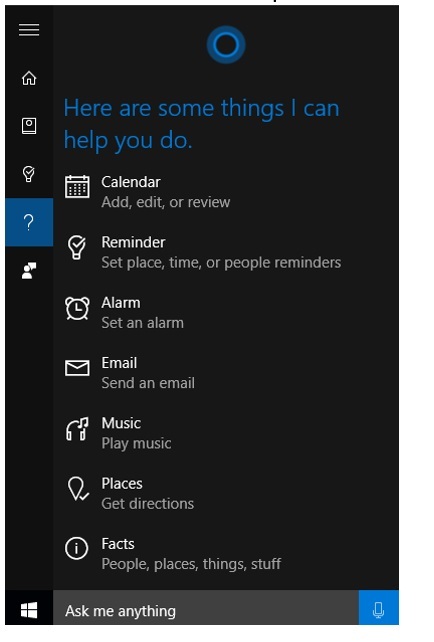 · In casual questions, Cortana was adding a period at the end of sentences instead of question marks. 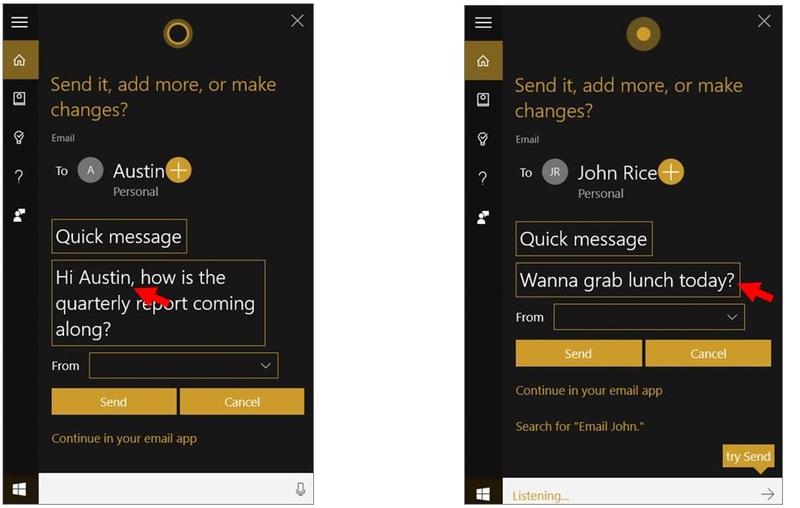 Now, with improved handling of casual conversation Cortana will correctly inserts a comma after salutations and end of sentence punctuation allowing users to seamlessly send email and text messages using only their voice. We received consistent feedback that users wanted a quick way to navigate to popular websites using voice input. The team investigated and found that users preferred to speak the name of websites rather than URLs. Now, Cortana will directly navigate to users to a site if for example they say “go to Microsoft store website”, no longer requiring a full URL. 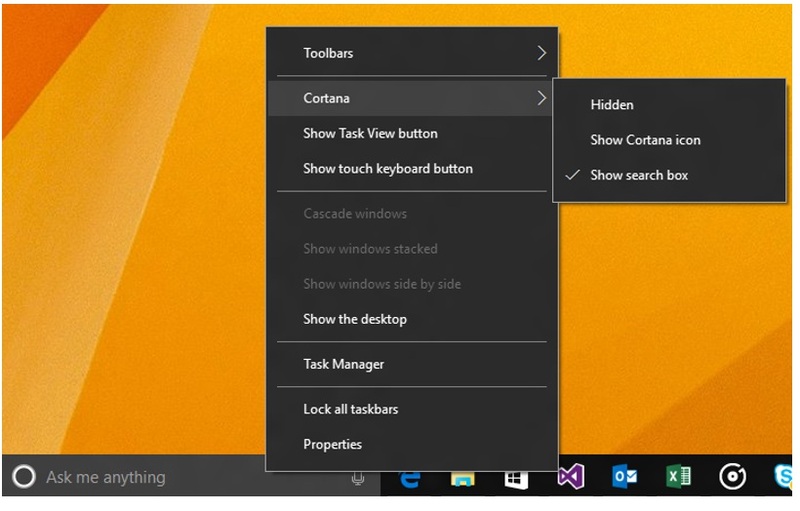 Windows 10 search experience is focused on helping you quickly get to your applications, settings, files, Cortana tasks as well as helping you search the web faster. We are laser-focused on helping you complete your task in the shortest amount of time. 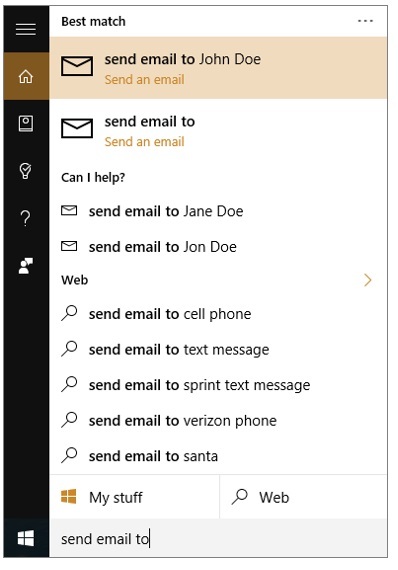 One example of a text search feature we added based on feedback is called “history based suggestions.” This lets you redo searches or Cortana tasks that you have recently done on that device. In the above example, the best match “send email to John Doe”, and the two suggestions inside the “Can I help?” suggestions group, are new suggestions that utilize the user’s recent history. We’ve seen such personalized history suggestions be very helpful in speeding up the task a user is trying to accomplish. We hope you love using Cortana as much as we love making her even smarter. As you can see, your feedback absolutely helps! We look forward to hearing more from you about how Cortana can help you achieve more. 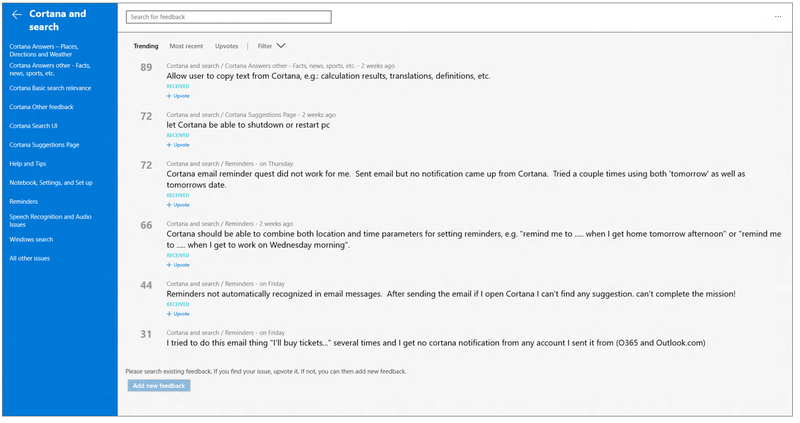 Go ahead and see what Cortana feedback other Insiders are providing right now.